Last night at UFC Fight Night 28, Ronaldo Souza was able to pick up an impressive win over Yushin Okami in the middleweight division. That victory established Souza as a legit contender in the division, as he was able to beat the “gate keeper” of the division in Okami. The “gate keeper” is a fighter that is good enough to be one of the top fighters in the division, but not good enough to beat the elite few on top. They will likely never be a champion, but they will never be without an important fight or spot within the UFC. Here are who I see as the gate keepers in the UFC. Flyweight – Ian McCall: McCall is a great flyweight, but already has proven that he can’t compete with the likes of Demetrious Johnson and Joseph Benavidez. He just doesn’t have the skills to break into the top. Bantamweight – Urijah Faber: Faber is a tremendous talent, but he was clearly outclassed by Renan Barao and lost his last fight with Dominick Cruz. Faber is just a step to slow to earn the title. Featherweight – Dustin Poirier: “The Diamond” is a great fighter, but he hasn’t been able to get the job done in his toughest fights. He will always be in discussion as a top-5 featherweight, but not able to get any higher. Lightweight – Jim Miller: Miller has tremendous heart and wrestling ability, but he can’t quite get to the mountain top. If a contender isn’t cut for the elite status, Miller will prove it. Welterweight – Jake Ellenberger: Ellenberger seemed primed for a title shot with a win over Rory MacDonald, but he failed to take his talents to that next level. He can beat most of the division, but not the very best. Middleweight – Yushin Okami: As said previously, Okami is a tough guy to get past, but if you can, it puts you in the 185-pound title picture. Light Heavyweight – Antonio Rogerio Nogueira: Lil Nog is a talented fighter, but doesn’t really show anything to make you feel like he could actually be the 205-pound champion. He has some big wins, but some bad losses. If someone is going to be a champ in this division, they have to get through him. Heavyweight – Antonio Silva: Silva proved he can’t be the champion of this division, getting hammered by Cain Velasquez on two occasions now. However, he owns wins over guys like Fedor and Alistair Overeem. Silva is no easy victory, but he doesn’t have the total package to be champ. The MMA gods can be very cruel. One minute you can be on top, the next you are at the very bottom. Such is the case for heavyweight Alistair Overeem. His fight last night at UFC Fight Night 26 was almost a perfect example of how quickly a career can change. Needing a win over respectable contender Travis Browne, Overeem seemed like the “Demoltion Man” early on, hammering Browne with big fists. He looked like a heavyweight contender once again. However, just moments later Overeem ate a picture-perfect front kick that led to a surprising KO loss. Now Overeem finds himself having lost two straight fights and, when you mix in a suspension that cancelled a title fight in 2012, he could be on the chopping block. It’s been a meteoric fall for Overeem, but he’s not the only one that has been in similar position. Here’s a few other notable quick collapses. Chuck Liddell – The Iceman seemed unbeatable when he was the UFC Light Heavyweight champion in the mid-2000s, but that all changed with a Quinton “Rampage Jackson” hook. One big punch from Jackson ended Liddell’s title reign and set the course for his surprising demise in the UFC. Liddell went on to go 1-5 over the next three years, losing four times by KO. He was forced to retire in 2010 after being blasted by Rich Franklin. Brock Lesnar – Lesnar seemed too good to be true, and he was. The physically imposing heavyweight broke onto the UFC scene in 2008 and was champion within a year. However, once Lesnar started to meet up with heavyweights that could match his strength and wrestling ability, he quickly turned into a softy. Though he beat Shane Carwin by submission, he was pummeled in the first round and that seemed to destroy his mystique. From there Cain Velasquez and Alistair Overeem ran right through him and Lesnar decided to retire from the sport. B.J. Penn – Though Penn is still considered by many to be the greatest lightweight in MMA history, he didn’t go out on a high point in the UFC. He seemed to be a human wrecking ball at 155 pounds after dominating the likes of Kenny Florian, Sean Sherk and Diego Sanchez, but a pair of decision losses to Frankie Edgar seemed to put his career on the wrong track. While he did pick up a quick KO of Matt Hughes after, he looked sluggish in a draw against Jon Fitch and was thoroughly picked apart by Nick Diaz and Rory MacDonald before taking time away. The fear Penn used to put into his opponents is long gone. The UFC has made a lot of noise about its schedule to end 2013. 7. Renan Barao vs. Eddie Wineland at UFC 165 (for UFC Interim Bantamweight title) – Barao is really a fighter that deserves more pound-for-pound credit. The guy has been a wrecking machine for quite some time. No disrespect to Eddie Wineland, who is a gritty fighter, but I don’t think he is in the same class as the champion. Wineland has a puncher’s chance, but this should be an easy defense for Barao. 6. Ronda Rousey vs. Miesha Tate at UFC 168 (for the UFC Women’s Bantamweight title) – I have a great deal of respect for Rousey and her skills. She has already established herself as a dominant champion in this division. I just don’t see Tate being able to win this fight. Rousey made quick work of her the first time and I don’t think that will change the second time. Tate would have to overpower Rousey with striking, and that is not her game. I think a fight with Cat Zingano would have been much more entertaining and had a greater possibility for an upset. 5. Cain Velasquez vs. Junior dos Santos at UFC 166 (for the UFC Heavyweight title) – This is the trilogy fight for these two, but both fights have been decisive loses for each man. I think the second fight told more about the matchup than the first. Velasquez was able to tire dos Santos in the first round with his aggressive pace. As long as Velasquez can avoid the big punch from the challenger, he should be able to dominate this fight again with his wrestling and ground control. 4. Jon Jones vs. Alexander Gustafsson at UFC 165 (for the UFC Light Heavyweight title) – Jones has been absolutely dominant in this division, but Gustafsson appears to be a new challenge for Jones. Like the champion, Gustaffson has the ability to use his length to gain a striking advantage. The length edge that Jones always has on his opponents won’t quite be as much of an advantage in this bout. The question coming into this fight is can the challenger handle Jones’ wrestling, and can he go 25 minutes if need be? 3. Georges St. Pierre vs. Johny Hendricks at UFC 167 (for the UFC Welterweight title) – GSP has been the kingpin of this division for a long time, but Hendricks seems to have the right style to finally dethrone the champion. Hendricks has the wrestling background to contend with St. Pierre, but has the powerful hands to knock him out. The question will be if Hendricks can deal with St. Pierre’s jab and technical striking, and if he can go 25 minutes. If the fight ends quickly, Hendricks will be the champ. If the fight goes into the later rounds, you would have to think GSP will retain his title. 2. Chris Weidman vs. Anderson Silva at UFC 168 (for the UFC Middleweight title) – Was it a fluke when Weidman beat Silva? I think so, but the champion will have a chance to prove me wrong at UFC 168. I am looking forward to see how Silva approaches this fight. I truly believe if he is focused on winning and not putting on a show, he can’t be beat. I feel he could have beaten Weidman whenever he wanted to in the first fight, but was trying to embarrass the opponent instead, and got caught. This time around, will Silva take the fight seriously? Will he try to prove a point again? Weidman will probably have to have the fight of his life to win. 1. 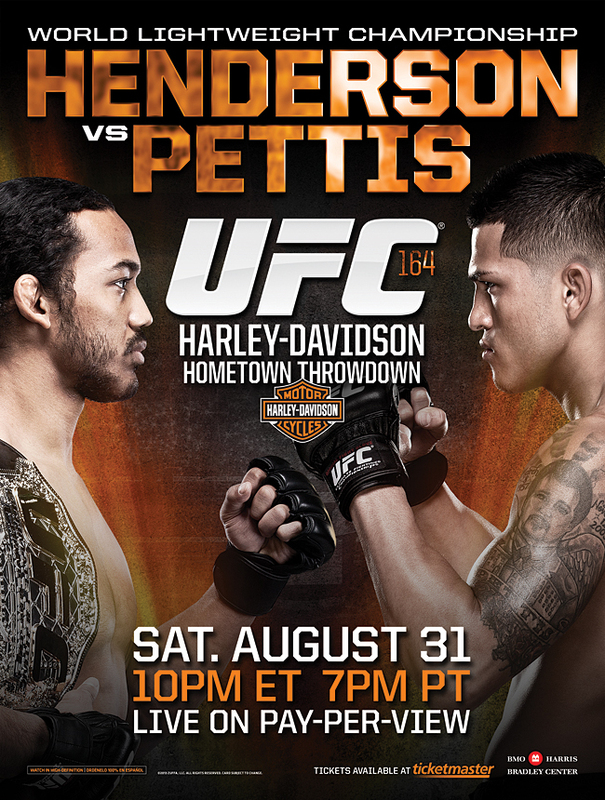 Ben Henderson vs. Anthony Pettis at UFC 164 (for the UFC Lightweight title) – Of them all, this fight has me the most excited. The first fight between these two was tremendous and non-stop action. Now, both fighters are greatly improved. Henderson has evolved as a powerful striker with great wrestling and scrambling ability. Pettis is one of the most skilled and dynamic strikers in all of MMA and he is tremendous at fighting off his back. Both men can go 25 minutes and have plenty of motivation to win this fight. I expect this fight to live up to the hype. The UFC on FOX 8 takes place this Saturday and the buzz isn’t quite there for this card like it has been for previous UFC on FOX cards. That’s not to say there aren’t great fights – there are. But, the UFC seems to have an issue in drawing interest in one of their most exciting divisions. For the second time on FOX, the card will be headline by the flyweight division (125 pounds). If you simply watch the UFC for fights, then this is no issue for you. The flyweight division provides plenty of excitement, and while the fights usually go the distance, but push a fast pace the entire time. But, if you are FOX, or even if you are UFC brass concerned about ratings, the flyweights probably aren’t the ideal. It would be easier for the UFC to market this card on the co-main event of Rory MacDonald vs. Jake Ellenberger than it is to market it on Johnson for John Moraga. I am going to guess many casual UFC fans don’t even know who Moraga is. There is a reason that the flyweights have yet to main event a UFC PPV card. It is because the UFC can’t sell tickets on a flyweight bout. It’s not even very often that a flyweight bout has been part of a UFC PPV main card at all. What the UFC really needs is one of two things. They need a legendary fight to come from Johnson vs. Moraga or they need an amazing highlight-reel finish. If Johnson and Moraga put on a legendary fight, something along the lines of Forrest Griffin vs. Stephan Bonnar, it allows the UFC to market the two in a similar way and create some buzz for the division. People will want to see both men fight again, either against each other or against new opponents. If that can’t happen, the UFC needs someone to emerge as the clear start of the division. To do that, the organization needs an incredible knockout or submission finish in the fight. The reason Anderson Silva and Jon Jones draw like they do is because they can do some amazing things in the cage and people want to see that. If a flyweight can establish himself as a star, it will give the UFC the ability to market them as a PPV main event. It didn’t take long for Anderson Silva to change his mind about his fighting future. Just moments after being knocked out by Chris Weidman in the main event of UF 162, the long-time middleweight champion said he no longer wanted to fight for the title, and a rematch with Weidman wouldn’t be happening. A week later, the rematch has already been booked. Weidman will make his first title defense against Silva as the main event of UFC 168 on Dec. 28 in Las Vegas. The champion, Weidman, is the clear underdog in the rematch, as many feel Silva can beat Weidman as long as he doesn’t clown around. It is not often that a champion comes into a fight, especially a rematch against an opponent he already beat, as the clear underdog. Only a few come to mind when it comes to title fights. Matt Serra vs. Georges St. Pierre at UFC 83: Serra shocked the world by winning the UFC Middlweight Championship, beating GSP at UFC 69, but most looked at the win as a fluke. Serra did little to fight off those opinions in the rematch, as St. Pierre dominated the bout and finished him off with body shots in under 10 minutes. Frankie Edgar vs. B.J. Penn at UFC 118: Edgar won a controversial decision over Penn at UFC 112 for the UFC Lightweight Championship, and shocked the MMA world just by lasting 25 minutes with Penn. Many expected a motivated Penn to come out and run through Edgar in the rematch, but the opposite happened. Edgar fought a nearly flawless 25 minutes and earned the decisive decision over Penn. It was a fight that put Edgar on the map and forever dethroned Penn as the king of the lightweights. Tim Sylvia vs. Andrei Arlovski at UFC 61: It was at UFC 59 that Arlovski looked to be set to successfully defend his UFC Heavyweight Championship against Syliva. He had rocked the challenger with a big hand that sent Sylvia crashing to the mat. However, Sylvia got up, and as Arlovski was in a flurry trying to finish the fight, Sylvia caught Arlovski right on the button and finished him for the shocking comeback win. Months later, the two had the immediate rematch and many expected Arlovski to get the best of Sylvia, but that didn’t happen. In a rather tame fight, Sylvia won a 25-minute decision. Arlovski was too timid and seemed to be afraid of getting knocked out. The former champion never seemed to be the same fighter after losing to Sylvia.